In today’s world with the introduction of supreme qualities of cameras within the handset, one word certainly has risen to prominence and that word is selfie. Taking once shot from one’s front camera or the primary back has begun a tradition, with estimated selfiholics at least take minimum 5 selfies a day. Your sitting idle got nothing to do. Oh! Let’s take a selfie, I’m having an interesting background. Oh! Let’s take a selfie. This is how it goes. The reason why we are here is to serve you the best selfie apps that are available on the iOS platform. So if you are an iOS user, or even if you aren’t you can simply go to through some of these best apps for taking a selfie, it may or may not be present on another platform such as Android or Windows. 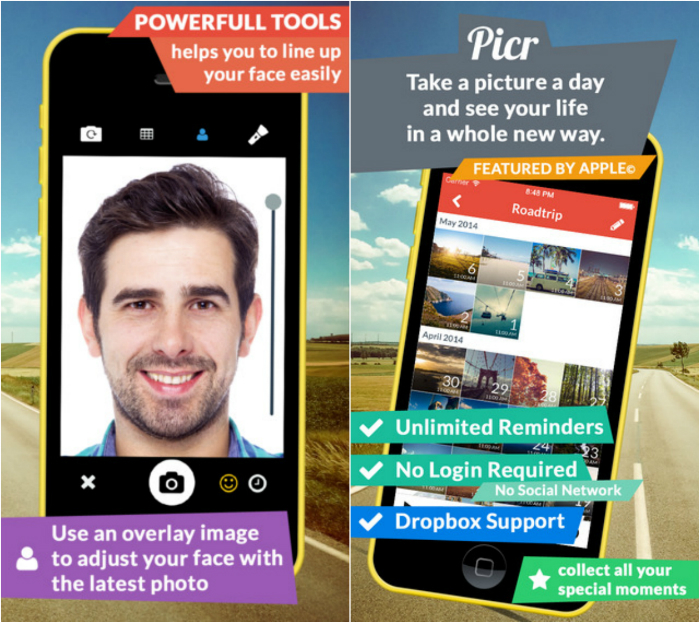 Such an amazing app is Picr that it acts as your selfie journal. Moreover it reminds you to snap a pic of yourself every day. While an interesting feature in this app is that over a year’s time period, you can simply then put together a short video of yourself. The reminding function in the app is perhaps the most noticeable feature. Now initially this app comes to you for free, but in order to upgrade to a Pro version where you can avail the service of adding unlimited reminders, you are required to pay just $2.99, to unlock all its features as an in-app purchase. Click Here: Get Picr for your iDevice from here. FaceTune is basically more of an editing app, as it focuses on the minute details in the picture while focusing on an object and thus it works serious wonders on blemishes. You can edit any Photo with FaceTune. Such is the quality of editing that you can work on adjusting your skin texture, yellow teeth as well skin blemishes. It’s a great photo editing app along with the selfielogy in it. You can download it from the app store for $2.99. 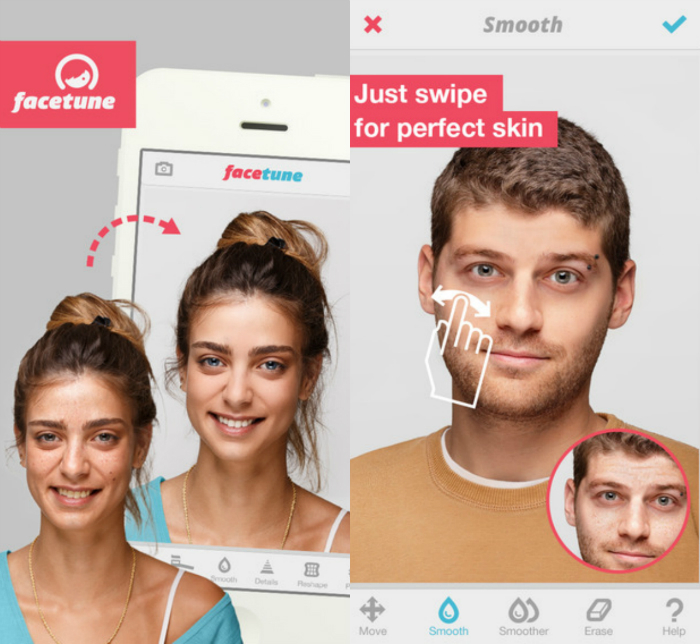 Click Here: Get FaceTune for your iDevice from here. Candy Camera for me personally is the best selfie apps as it does not captures the minute details but simply provides you variety of effects that are in itself enough to change a person on the whole. Candy Camera is one the best known app for selfie and you are surely a selfieholic if you have it in your Photography section. It is completely free to use but for some additional function you will have to upgrade to an affordable $9.99 premium version. Click Here: Get Candy Camera for your iDevice from here. What do I need to tell you about a selfie apps that has been downloaded more than 100 million times and is used by them world-wide. Along with the power packed camera, Cymera has tempting features such as Retouch, filters, collages and decorating as well as changing the minute details, you can also use make-up as well as trim your face. Those are some extra-ordinarily amazing features provided by the developers. If you want to install Cymera on Computer then follow this tutorial CYMERA FOR PC. Click Here: Get Cymera for your iDevice from here. The aforementioned were few of the perfect selfie apps that are available on the iOS platform, not forgetting the likes of SnapChat, which has one of the most powerful camera, but I personally prefer not to add it, because it is mainly focus on the social networking chatting rather than an app purely made for selfie. Get your desired selfie apps now from the above clicks by simply clicking them and transform your selfie experience into a better one.